Capers (Capparis Spinosa) other names: Alcaparras, Cabra, Caper Bush, Capparis rupestris, Capparis spinosa, Cappero, Câprier, Câprier Épineux, Câpre, Câpres, Fabagelle, Himsra. 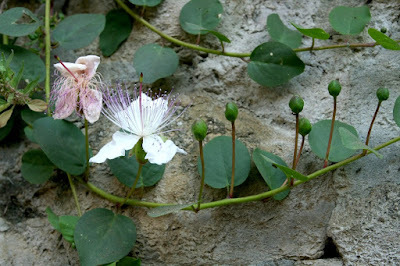 The capers (scientific name Capparis spinosa) is a perennially growing plant that is winter-deciduous. This is a bushy plant bearing curved, fleshy leaves and large flowers. Capers is a shrub-like plant with numerous branches. The thick, glossy, round to ovate-shaped leaves appear alternately on the stem. The blooms of the capers are complete, flashy and have a sweet aroma. Each flower of capers has four sepals and four petals whose color may vary from white to pinkish. The flowers of capers have numerous elongated violet-hued stamens and a solitary stigma. Usually, the stigma grows higher than the stamens. People grow this herb for its edible flower buds (called capers), which are widely used as a seasoning agent. The fruits of the herb, known as caper berries, are also consumed, usually after pickling them. There are a number of Capparis species that are also pickled together with C. spinosa, which are mainly cultivated for their buds and fruits. 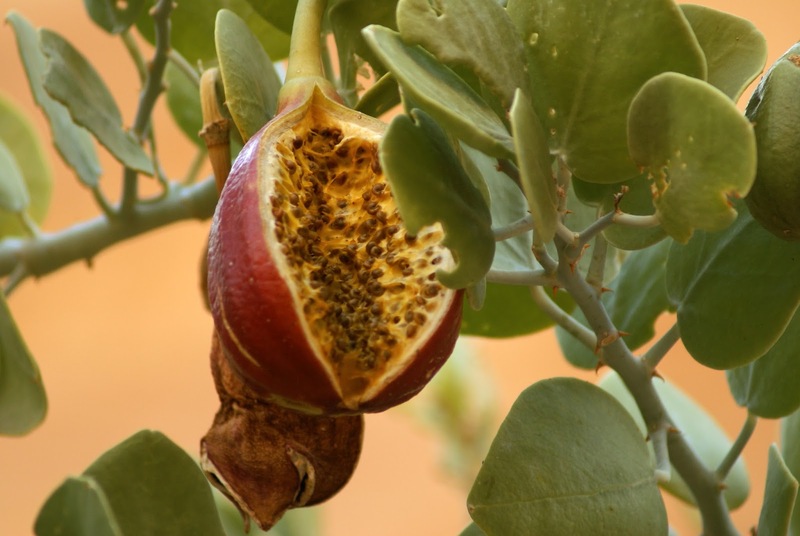 Various other parts of Capparis plants are used for different purposes, including in the manufacture of medicines and cosmetics. 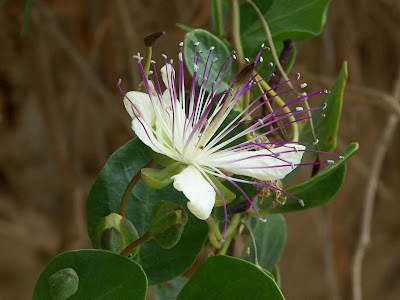 The capers or C. spinosa has its origin in the region around the Mediterranean, Madagascar, East Africa, the Himalayas, south-western Asia, Central Asia, Indomalaya, the Pacific Islands and Australia. In fact, this species can be found in nearly all the countries in the region of the Mediterranean and is also incorporated in the flora of most of these countries. However, it is still not sure if the species is native to all these regions. Despite the fact that there is considerable endemism is the vegetation of the region around the Mediterranean, it is possible that the caper bush has its origin in the tropics and was naturalized in the Mediterranean basin at a later stage. The capers is a plant. The unopened flower bud and other parts that grow above the ground are used for medicine. People use capers for diabetes, fungal infections, chest congestion, worms in the intestines, and a skin disease caused by parasites called leishmaniasis. Capers are also used as a tonic. Capers offer a number of health benefits. Consuming these small berries on a regular basis helps to ensure that your skin always remains well moisturized. Alternatively, you can also apply capers to dry skin to moisturize it. Capers are believed to be effective for treating a variety of skin problems, including irritation, skin redness and acne. It has been found that capers have rich rutin content - a bioflavonoid that makes the capillaries stronger and helps in relieving conditions such as rosacea, a condition that causes pimples and redness on the face. Capers also contain another bioflavonoid called quercetin, which possesses anti-bacterial as well as anti-inflammatory attributes. This bioflavonid helps in lessening acne development and several other skin infections. Capers berries also contain extremely elevated levels of antioxidants, which go a long way in putting off oxidative stress by free radicals on the cells. As a result, consuming capers helps in inhibiting the aging process. Owing to these various health benefits of capers berries, they usually form a vital ingredient of several skin care and cosmetic products. As capers berries also contain vitamin B and the essential mineral iron, they are useful for the heath of our hair and its healthy growth. In fact, vitamin B is responsible for enhancing blood circulation, which, in turn, promotes hair growth. At the same time, this nutrient makes the hair shiny and look beautiful. The presence of iron helps in putting of hair loss and also promotes hair growth. In terms of size, capers berries are tiny, but they are loaded with several nutrients that help to protect us from various grave ailments, counting cancer. Capers berries are a wonderful natural source of antioxidants that combat the harmful free radicals and help to put off the development of serious health conditions like heart diseases and cancer. Findings of several scientific studies have shown that although the capers berries are tiny, they enclose a potent phytochemical called stachydrine that works in the form of a potent agent that prevents formation of malignant or carcinogenic cells, especially providing protection from prostate cancer. These studies also found that stachydrine works at the genetic level and puts off the growth as well as proliferation of prostate cancer cells. Our body has a protein complex called NF-kappa B that is activated when we suffer from ailments like arthritis, cancer, atherosclerosis and other ailments that are accompanied by inflammation. It has been found that the bioflavonoids present in capers berries are effective in inhibiting the nucleus factor from being activated. This finding is considered to be a promising advancement in the field of drug research. In addition to the above mentioned nutrients, capers also contain high levels of dietary fiber that works to improve digestion. Dietary fiber not only contributes to the bulk of stools, but also ensures regular bowel movements, in addition to putting off bothersome problems related to digestion such as constipation. In addition, this fiber also possesses cleansing attributes, which are effective in diminishing the chances of developing digestive problems as well as serious diseases such as colon cancer. Capers are also said to be an excellent natural remedy for alleviating flatulence and stomach aches. It has been found that extract from capers berries is effective for unwinding the blood vessels and, therefore, it may prove to be effective in lowering hypertension (high blood pressure). However, it is suggested that people enduring high blood pressure should consume fewer capers berries, because they contain significant amount of salt. The antioxidant rutin is basically a sort of bioflavonoid that is abundantly present in capers. This particular bioflavonoid possesses the aptitude to sustain the flexibility as well as vigour of capillaries, thereby, effective for treating stressed blood vessels, which have the potential to cause hemorrhoids. This attribute of capers is said to be helpful for people who are enduring chronic venous insufficiency - a health problem that is marked by the inability of the veins to send back blood from the legs to the heart for purification. Venous insufficiency often results in other related problems such as cramped legs, swelling of the ankles and varicose veins. Rutin possesses potent antioxidant attributes which help to slow down the oxidation of LDL or "bad" cholesterol caused by detrimental free radicals. At the same time, rutin also puts off the build up of oxidized bad cholesterol in the arteries. All these aid in reducing the chances of developing a number of health conditions, including strokes, heart attacks and atherosclerosis. In addition, it has also been found that rutin has anti-inflammatory actions. As a result, it is useful in putting off inflammation and, hence, can be used for treating arthritis. As discussed earlier, capers possess antioxidant attributes and also enclose specific compounds that may be useful in keeping the blood sugar levels in check. People who are already taking medications for diabetes should preferably avoid consuming capers. This is because consumption of capers berries may result to a sharp drop in their blood sugar levels - often to very precarious levels. Consuming capers offers several health benefits and one among them is the fact that it supplies us with sufficient amounts of iron, an essential mineral that is mainly related to the red blood cells’ health. Iron also has a very important role in transporting oxygen in our body. Precisely speaking, this essential mineral helps the red blood cells to transport oxygen throughout the body. In addition, iron is also necessary for new cell production as well as their development. The cells in our body use iron to produce enough energy to enable them to carry out their multiple functions. In other words, this essential mineral helps our body to function healthily and carry out its routine functions. Consuming foods that contain high levels of iron not only puts off iron deficiency in our body, but also protects us from several diseases like anemia. Capers also contain rich amounts of certain nutrients that ensure the health of our bones and also make them stronger. These berries enclose vitamin K, which not only makes the bones stronger, but also puts off bone density loss. Capers also enclose a number of other essential minerals, including calcium, potassium and magnesium, which are responsible for bone building as well as sustaining their health. When you include capers in your diet, you actually reduce the chances of a number of health conditions related to our bones, including osteoporosis. It is believed that consumption of capers berries helps in lessening flatulence and it has an anti-rheumatic action. Capers are widely used in Ayurvedic medicine. Available documents show that capers (known as Himsra in Ayurveda) protect our liver and improve its functioning, as they are considered to be hapatic stimulants. In addition, it has been documented that capers have also been used for treating arteriosclerosis, and in the form of tonics, diuretics, vermifuges as well as kidney disinfectants. Traditionally, people have been using infusions and decoctions prepared from the root bark of capers plants for treating a variety of conditions, including arthritis, anemia, dropsy and gout. Capers pulps as well as extracts have been employed in manufacture of various cosmetics. However, there are reports that in a number of cases using them have resulted in sensitivity and contact dermatitis. After harvesting, capers are usually stored in a brine solution, which contains elevated levels of salt. As a result, the sodium content of capers is also relatively high. Precisely speaking, one tablespoonful of canned capers berries encloses approximately 250 mg sodium. It is important to note that our body requires sodium in small amounts with a view to sustain the fluid balance inside as well as around the cells. However, too much of this mineral may result in many health problems. Intake of excessive salt/ sodium may result in increased risks of high blood pressure (hypertension), which, in turn, may sooner or later be responsible for developing heart diseases. Hence, it is suggested that people enduring high blood pressure or people with a family history of hypertension should only consume a moderate amount of capers berries - never exceeding 1,500 mg sodium daily. While capers are really flavourful, you need to ensure that you only eat few of them in order to keep health problems at bay. Remember, consuming too many capers berries causes higher sodium intake. Some people apply capers directly to the skin for dry skin and other skin disorders and for improving blood flow near the skin’s surface. Capers are also eaten as a food and used as a flavoring. Apart from the capers’ medicinal benefits, these berries are also used for culinary purposes. As the capers berries can only be collected by hand, it makes the harvesting process very tiresome. As a result, these berries are priced very highly. In fact, people have been using capers for cooking since ancient times. The small capers berries are wonderful as toppings for pizza, fish, and chicken as well as meat preparations. In addition, they may also be used in salads, sauces, stews and soups. Precisely speaking, capers can be used in numerous different ways to make your food additionally delicious. Therefore, next time if you want to add a salty or sour tinge to your dishes, you may try these berries. Commercially available capers are basically undeveloped flower buds that are either preserved in coarse salt or pickled in vinegar. You may also pickle capers berries or the partially mature fruits of the plant as well as their young shoots along with tender leaves for using them later in the form of a condiment. Many describe caper’s flavour as something akin to that of black pepper and mustard. Precisely speaking, the potent flavour of capers has its origin in mustard oil. The flavour is attributed to a compound called methyl isothiocyanate, which is discharged from glucocapparin molecules that come into existence when the plant tissues are crushed. It is worth mentioning here that capers have a vital contribution to the characteristic Mediterranean flavours comprising rucola (garden rocket or argula), olives, artichokes and anchovies. The gentle young capers shoots accompanied by small underdeveloped leaves are also edible. These are consumed in the form of a vegetable or pickled. Although rare, many people also cook and eat the mature as well as partially mature capers berries in the form of a vegetable. In addition, the ash obtained after burning the capers roots has also been used in the form of a salt source. Capers are likely safe for most people when eaten as a food. There isn’t enough information available to know if capers are safe in medicinal doses. Capers can cause skin rash and irritation. Capers can cause skin rash and irritation. Pregnancy and breast-feeding: Capers are likely safe when eaten as food, but there’s not enough information to know if they are safe in the larger amounts that are used as medicine. If you are pregnant or breast-feeding, stick with food amounts until more is known. Diabetes: There is some concern that capers might alter blood sugar control in people with diabetes. Monitor you blood sugar closely if you have diabetes and use capers. Surgery: Capers might affect blood sugar levels. There is some concern that capers might interfere with blood sugar control during and after surgery. Stop using capers at least 2 weeks before a scheduled surgery.